markets | art by mags! oh i know. 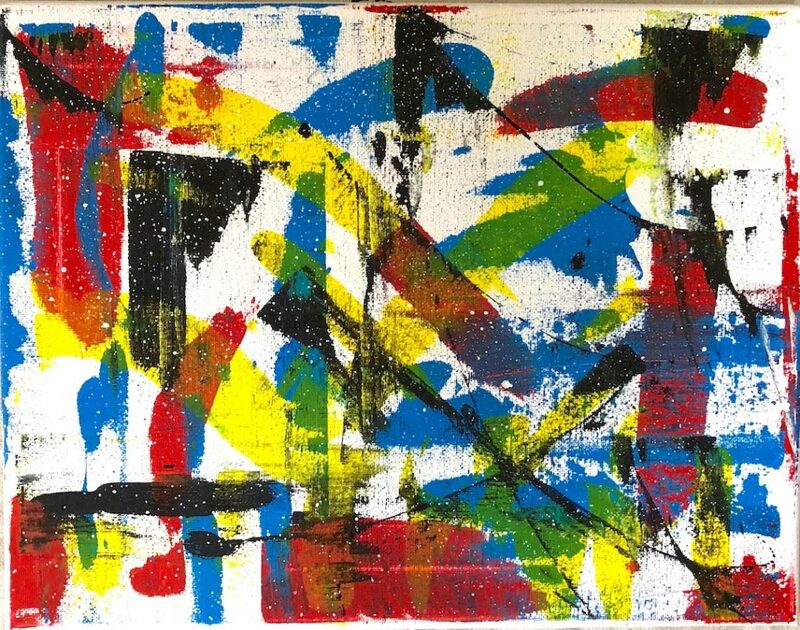 i have not been very good at keeping up with this blog, ever since i started the new one where i write about more varied and personal things other than my art/craft life. it’s also been a fairly slow time for said art/craft life. post-holidays through mardi gras is always slow for me, since i don’t really make anything that is mardi gras-focused and the weather is usually crappy enough to keep me from any of the outdoor markets (and from wanting to work on making new stuff outdoors). i’ve had a slow-but-steady trickle of etsy orders, and did get a little bit of a boost from the publicity mentioned in the previous post. but it’s not been anything close to “normal” levels of business. it’s been beyond slow, really. but here we are in mid-march (how did that happen?). mardi gras is over and st. patrick’s is tomorrow, with st. joseph’s day hot on its heels this weekend. the weather has been absolutely gorgeous for a few weeks; perfect new orleans springtime, with loads of sunshine and temps in the 60s and 70s. (apologies to all the northerners who have still been dealing with winter up until now.) i have been riding my scooter and bicycle a lot, and taking daily walks in city park for exercise, while enjoying the outdoors as much as possible. i don’t, however, think i’ll be doing a lot of outdoor markets anytime soon. i’m just not making enough money at them to justify the ever-increasing booth fees. the only two i have on my calendar right now are on april 2nd, i’m helping miss malaprop out at the picayune street fair in picayune, mississippi… and then on april 16th i will be at tulane’s crawfest. the picayune street fair is actually a weekend-long event but i think i’m only going up on saturday, unless sales are just so good i can’t stay away on sunday. and crawfest is an annual treat for me; i’ve been doing it for years and it’s one of my favorites, due to the excellent music and all-you-can-eat crawfish! i am starting to get back outside working on new stuff, though. and i’ll be stocking up for my friend jen’s annual funky lil’ art show in her home during jazzfest, which is just around the corner now. the opening for that will be april 22nd and i’ll have more info on that as it draws nearer. but you should put it on your calendar now to either come to the opening or remember to stop by her place on your way out of jazzfest any night so you can pick up some awesome, reasonably-priced local art and craft. she’s got an ecclectic array of creative friends and there’s always a party going on over there during jazzfest. that’s about it for now. just a little hello to let you know i’m still here. still making stuff. still selling stuff. still available for custom commissions. and one-color t-shirt runs if it’s simple enough. and if you want to keep up with all my latest creations, bookmark my etsy shop and also my flickr page. i might not always think to make a blog post about things but i almost always take photos of anything i make and post it to flickr. use the code: 20OFFSALE til midday friday, at which point i need to pack everything up for the freret market the next day. yes, i decided to go ahead and do it. thankfully, it looks like it will be sunny, though kinda cold. i’ll be wearing my long johns, for sure. i will hopefully have lots of new stuff (if it doesn’t all get bought up in the sale!). 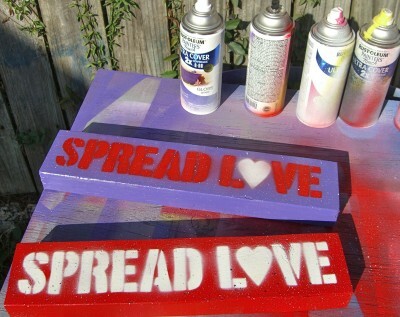 lots of funky handmade gifties for your valentine, and maybe even a few things to decorate for carnival. see you there! well surprise, surprise. just when i thought the arty-crafty biz was in the shitter… suddenly, without me even really trying much, stuff is selling. (thank you, universe!) i put very little effort into marketing this holiday, i made very little “new” stuff (i made some bottlecap signs and a handful of clocks and printed some scarves, but no new designs), and i only had 3 markets in december. but all the markets turned out pretty ok, especially last night’s “last stop shop” which was actually pretty great. we had a lot of fun and a good crowd and for the first time in a long while, i sold lots of stuff! it was nice and reassuring. and then today, i’ve had a big sale on etsy – the last of my rachel maddow stencil paintings, which i’d basically given up on selling and hung on my own wall, FINALLY SOLD (along with a clock in the same order) – and have had a few custom orders via email come in. and there’s still a week left before christmas, so i think i’m gonna put a little effort into trying to list everything i’ve got left up on etsy and maybe even craigslist, to see how much i can get rid of. see, i think the key to me finding new inspiration is to GET RID OF ALL THE OLD STUFF that’s cluttering up my view. i have this problem, in that, i actually LIKE much of what i make – and really, most of the things i make and sell started as something i made for myself, to decorate with, to wear, or to give as a gift to someone i love. and then i started making more of them. but so, i often end up decorating my own house with some of the things i make, making them hard to let go of… and also, making it hard to come up with new ideas. maybe it doesn’t make any sense to anyone else, but i have often found, when i don’t have much of my own work around, then it makes me want to come up with new stuff. but whenever i have lots of it still around – like now – it’s harder to feel inspired. instead i feel defeated because so much of my stuff hasn’t sold, like nobody actually likes or wants it, besides me. anyways. big thanks to all who have been supportive – either by purchasing stuff, recommending me to others, or even just offering encouraging words – this holiday season. it really means a lot to me. and apparently it’s helping! 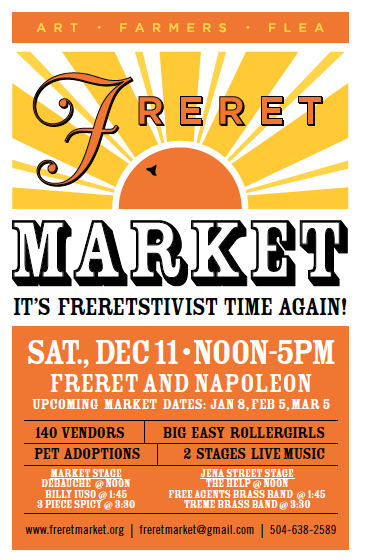 freretstivus market, that is. TODAY! noon til 5pm – i will be there. come enjoy the beautiful day before we get more nasty weather tomorrow. and don’t forget about the last stop shop at the big top on thursday, 6-10pm (1638 clio street). and remember, i do custom work also… so if there’s a clock or sign design you like, i can make it in your favorite color combo and have it done in plenty of time for christmas. i even have some blank scarf material in stock and could print up the scarf of your choice. so don’t be shy – just ask! the anticipation of moving is just about killing me. i can start moving in on the 10th, though i’m paying rent on iberville until the 20th (my 30 days notice). the days can’t move fast enough. it feels like the pace of my life has picked up considerably in the past week or so. every day feels hectic now. i’ve started to pack up, though not terribly quickly. but the boxes are starting to pile up in corners. fae is completely moved out with the small exception of a few storage boxes in our walk-in closet, which we will get to some day in the next week or so. the house is, therefore, half empty. it feels very weird still being here, trying to maintain my routine and schedule in a half-empty, partially-packed up apartment. the cats are very confused and a little freaked out, particularly when my landlord brings people through looking at the apartment. 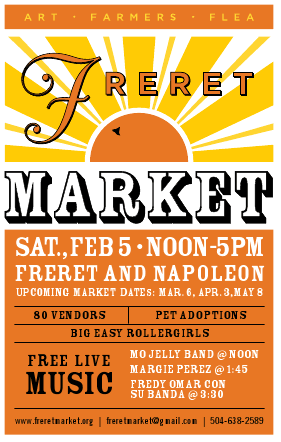 and, i must be crazy, but i somehow got talked into doing the freret market this saturday. i haven’t done a market probably since freret back in march or april (can’t remember, but it’s been a long time), and i haven’t really made anything new since then either. i’ve been in a creative funk. so i’ve had all this stock that i made in the spring, thinking that i was gonna stay on top of sales and stay well stocked and maybe start getting some into stores, just sitting around gathering dust. so i’m making this market a clearance sale. if you like my stuff and want to stock up for holiday gifts, now would be a good time to swing by and grab some stuff. make me a REASONABLE offer on anything and i won’t refuse. i need money for moving, and i also really don’t want to move more than i have to… so if i can liquidate some stock, less stuff to move! i’m gonna have a $3 bargain bin of tshirts, ties, tanks, shorts, pants, and any other printed apparel i can find. cufflinks are gonna be $10. and signs and clocks and prints will be at least $5-$10 off. really – make me an offer on anything. i just want to move product. and, just so you know… i’m thinking of not making the clocks anymore. i’m kind of tired of them, and there are now several copy-cats around town making other sorts of record clocks and selling them for way less, therefore glutting the market. i will still make custom orders – like if you just really gotta have a black and gold fleur de lis clock or blue nola heart or red scoot clock, fine, i’ll hook you up – but i’m just so tired of lugging all the boxes around and having to store so much inventory. SO… all this is to say, i’ve got about 30-40 clocks of various sizes/designs/colors left, but when they are gone, that’s it. come out to freret market on saturday, noon til 5pm, and get ’em while they last. 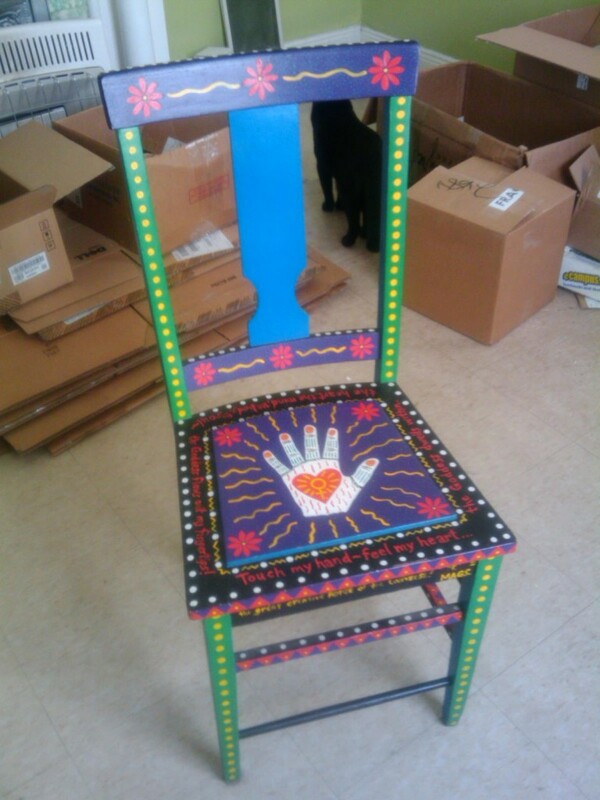 one last thing – and those of you who follow me on facebook will already know this – but i’m selling one of my folk art chairs from my early days (pic below). it was always one of my favorite chairs i decorated – i used to comb the thrift and furniture stores for wooden chairs with good lines and not much paint/varnish that i could strip and then custom paint in my then-geometric folk art style. this one’s a little woo-woo goddessy, but i still love the colors and the paint job has held up remarkably well for being 17 years old! one of a kind and a mags original! i’m saying $125 but really, if you like it, make me an offer. i really just don’t have space for this in my new place and i think it’s time it found a new home.